I have been researching how to get clearer photos with my Kindle Fire, hopefully I can get some satisfaction with my photos. This painting was pure heaven working on it. This painting was a “fast and furious” session, maybe that explains that rock on the left. I might go back and soften up some edges. The falls could use more definition, we’ll see. Oh my favorite scene! Again! So I am completely undecided about this one. I love the atmospheric appearance but I am thinking it needs more. 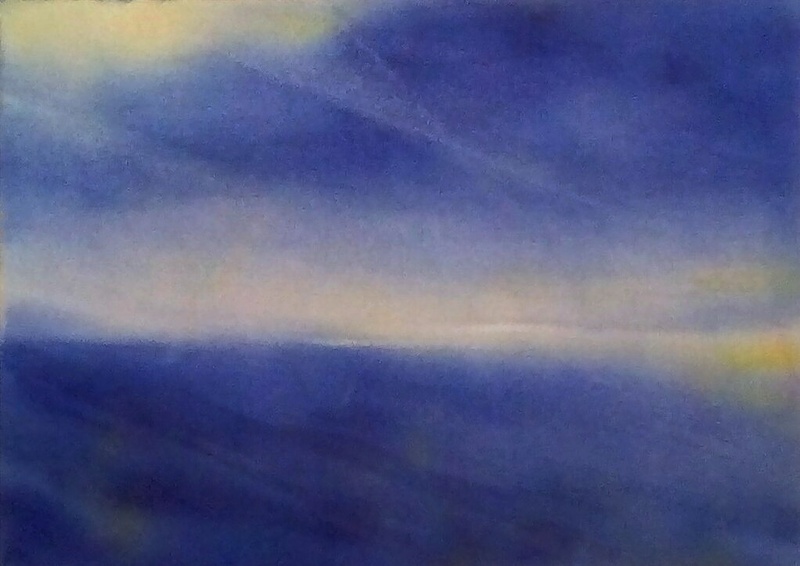 It was painted totally by intuition and in two layers basically swirling yellow and cobalt blue and indanthrone blue together with a touch of Ultramarine purple. I have no clue why I didn’t end up with green, that is a mystery. If any of you have wondered if I have gone missing for good, here I am! Actually what happened is that I have recently purchased a Kindle Fire tablet and discovered that I can use it to take and upload photos to Instagram. I have tried Instagram before using my cell phone but I hated the quality of the photos (picky me). Posting there is so much easier, less than a minute and I am done. It takes me forever to navigate around WordPress, I almost dread it because it is so funky and slow. I haven’t given up entirely on my blog here but if you want to see what I am up to follow me on Instagram: Here I am! I have also discovered that I can do a far better job of editing my photos of my paintings spot on. Going from my regular camera and editing I always seem to run into having my blues stand out a bit too much or my yellows are off. On Instagram I am amazed how spot on I can get my paintings to be. Plus it is so fun and easy. This painting was started as a plein air but finished in the studio. It was so difficult to capture what I saw there and I almost decided to turn this over and use the other side. I decided to finish it and I really like the water. This painting is not as yellow and pink in the sky, more subtle, keep that in mind. 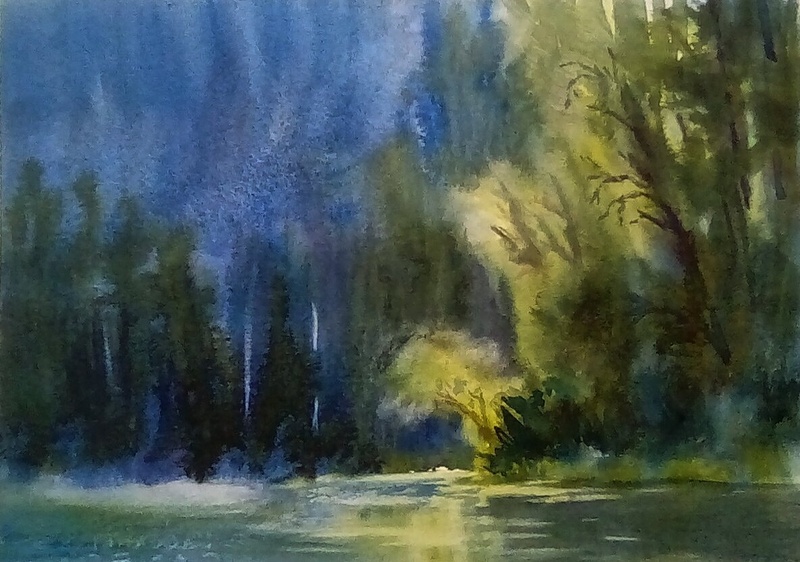 I had gone out to plein air paint at Bullards one morning, showed up at 5:45 am. So beautiful there but so very difficult to capture what I was looking at. I decided to sit and watch the light hit that section of trees and I think that about 30 minutes passed and I just sat and observed. In the not so long ago past, this would have upset me, the fact that I couldn’t capture what I was looking at. Once I got back into the studio, I decided to paint entirely from my memory of the morning. It was simply magical how it poured out of me. To realize that you can’t truly capture Gods’ creation to the absolute T is imperative to being at peace as an artist, imho. But, we sure can express how we feel about what I see or experience, that is for certain. That is my goal. Perhaps a little more detailed with the rocks than I like but then I had fun with this one. No don’t adjust your monitor, this was purposely painted with an out of focus, soft approach. I didn’t want to fuss with details or bringing it up to a finish, I wanted an impression, that is all. This was painted saturated wet on wet. Thank you for bearing with me on this long post, have a wonderful 4th of July for those who celebrate! **A word about photos. The paintings and photos on my blog are mine, taken by me and copying them would be stealing from me. If you find a photo that you would like to copy or use, I request that you ask me for permission and I expect you to give me full credit for my own photo. Thank you so very much. 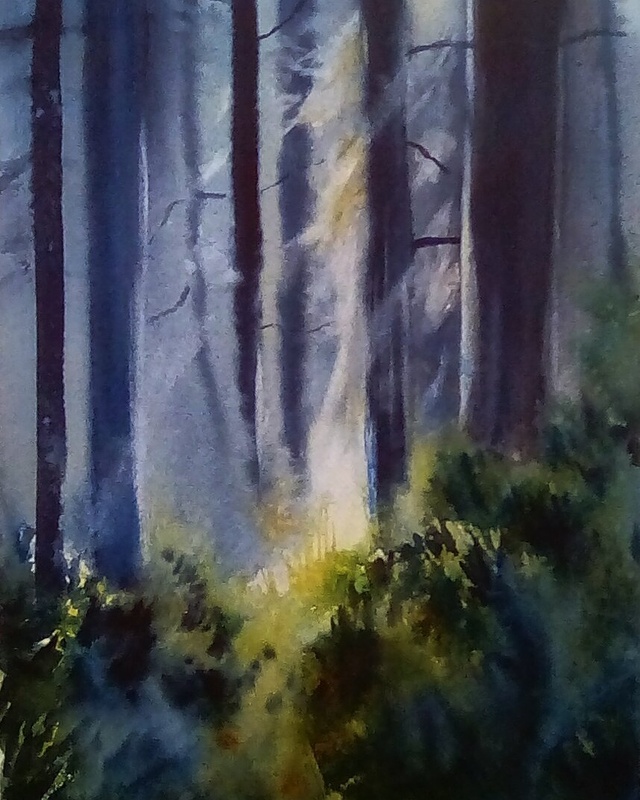 As I am working on a painting using Jodi’s photo, I decided to see if I could pull something out of a chaotic mess of a forest scene that I started a few weeks ago. I like to work on several paintings while waiting on one to dry, I grab another painting or start one. It seems to work for me because I get my eyes and mind off from the current painting. I almost threw it away but after looking at it, by instinct knew what to do. I am after expression and sometimes that perfectionist in me wants to rule the artist roost, I don’t think so! The painting above reminds me of some Canadian artists’ work that I admire. 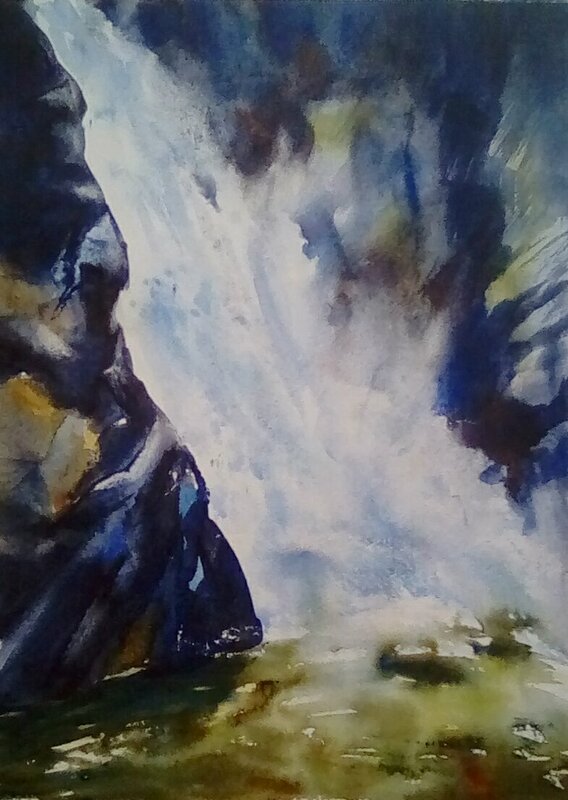 I think that what intrigues me about the art that has come out that great country is not only the beauty of nature but how the artist conveys it. Not only the majesty, but an essence that I can’t quite put my finger on. I am a great fan of the Group of Seven, a group of artists that painted the landscape of Canada. The above painting was also one that I started on the weekend. I wanted to take a photo that I had shot of a leaf under the water and see what I can do with it. The intention was to semi-abstract the subject. At least it was fun and a good learning process in the meantime. That picky nature of me wants to take the helm and trash it to bits but then I am after feeling and not perfection. So there you go! This is a studio painting that I painted several weeks ago. The photo was difficult to marry up to the real painting. The background is more of a greenish blue and the water is more of a yellow gold and there is more of an over all lime green throughout that isn’t showing up in the photo. I am not sure why I couldn’t get the correct depiction but I tried. I have many more paintings to share and deciding on which ones is difficult. Today I am working on a forest scene of light coming through a grove of redwoods, a photo that I took about 15 years ago. I have been busy with painting every day and loving every moment. I think that for now I am allowing myself to veer in the direction that my creative spirit thrives in. Such as the painting above. I didn’t want to fiddle around with all the little shrubbery, rocks and gravel so I decided to abstract that jumble of detail. I might work on this painting more and maybe not! I will let it sit for a while and we’ll see. I like this no pressure approach, it truly works for me. I can’t emphasize how important it is to get out in nature to experience it fully if you plan on painting it. I love painting portraits, you wouldn’t think that I do if you have been following my blog because you never see them! As a child the landscape has always pulled me, intrigued me to no end. While people tire of looking at landscapes whiz by while on road trips, my spirit soared. It wasn’t until I started plein air painting and hiking out to get to my spot to paint, that this love came to a deep realization. Know your subject and paint what you love, I can’t emphasize that enough. True, I love portraits but right now I think that I love landscape more. Yes, I am a loner, perhaps that has something to do with it? I won’t be able to paint or post for almost a week so I will be missing in action. My husband and I will be celebrating our 31st wedding anniversary on the 11th and will be staying for a few days on the Mendocino coast. Of course we are in the midst of one of the biggest storms that California has experienced in a decade! I had more fun painting this. I have been finding that using a rigger brush helps with keeping things exciting and loose and especially with those trees. I didn’t want excessive detail and brought out only what I thought would help the painting. I plan on buying a larger liner though because the one that I do have is kind of small. I got the idea of using a rigger brush from watching Sandra Lynn Strohschein paint in her videos. The top painting is one that I started a week ago and am taking a slow process completing it. I have yet decided to call it finished. The above paintings were painted while I was stuck indoors without power during a big snowstorm. I decided to haul my watercolor equipment down into the living room next to the north window and the woodstove. I used several plein air pastel paintings to use for my reference. I would like to know if anyone else has trouble with their WP account. I have the most difficult time putting my post together. I can’t hardly change anything here or even copy and paste. I am so close to letting it go because it is so frustrating. Any ideas? One of my pastel plein air that I used for a reference. I wanted to get out to paint en plein air before the next coming storm. When people think of California they think of beaches and the lack of snow. Ha! well, I live in an area that snow is readily available if it isn’t snowing at my house, it is snowing somewhere close by. This location is about 35 miles from my house and the road leading up to the Sierra Buttes is routinely shut down for the winter and opened to snowmobilers and snow sports enthusiasts. It is a personal pet peeve of mine that people have this conception that California is always sunny and short sleeved weather even in winter. With that complaint off from my shoulders, let’s proceed to my painting. After this painting experience I am convinced that I don’t like trudging through deep snow with my heavy pastel equipment. Either I have to make it lighter and more compact, or find a scene to paint from the road. I didn’t even bother with setting up my easel and painted holding my board. Not the best decision for me especially when I have trouble with my hands. I had completed my painting to about 75% and finished it up in the studio. I decided to take a hike on one of my favorite trails and reflect on painting and my experience today. I felt very much dissatisfied that I came away with only one painting but I decided to shake it off because I was able to paint regardless of how many or the quality. I also came away with over 300 photos to work from. All in all, it was a good day in Northern California.